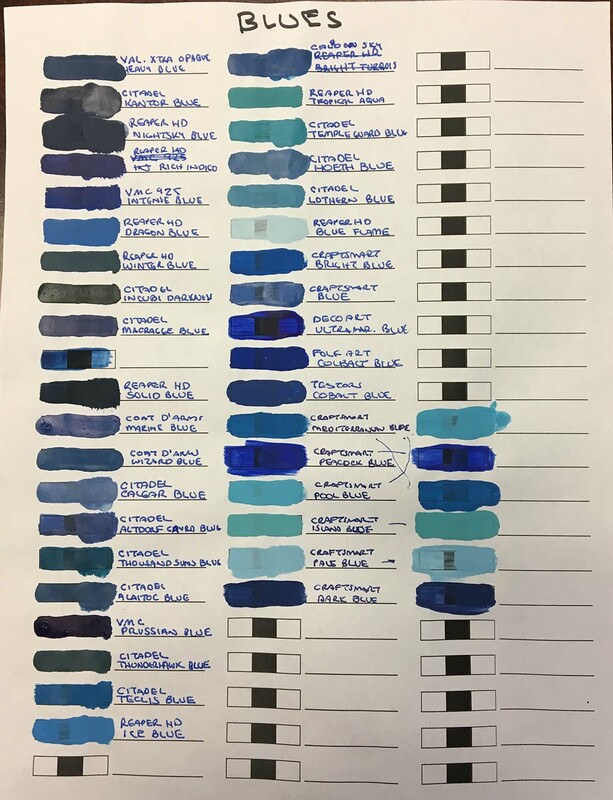 In preparation for painting a Zulu Wars British Force, I tested all 26 of the blue acrylic paints I own for opacity, coverage and vividness. I intend to do this with other colors as time permits. Medium Blue: Coat D’ Arms Marine Blue or Testors Model Master Acryl Cobalt Blue A/A/1/A if you prefer thinner paint. These paints would give you a very solid range of blues; I doubt you’d need any more. Obviously this test not comprehensive. I will probably add to it if I get more paints. I painted a double layer and single layer of each paint on a sheet of white 24 lb paper. The paper had solid black areas and black lines to test the paint’s opacity over a black basecoat. I used a Rosemary & Co. flat brush. I had already slightly thinned my Citadel paints when I decanted them into dropper bottles. The remaining paints were used “out of the bottle” and not thinned. A photo of the test sheet is below, but the colors are very approximate. The first number is “vividness” on a 1-3 scale, with 1 being a vivid blue, a 2 being an average blue and a 3 being a drab blue. This is a somewhat subjective standard, of course. A 1 is a very “good looking” blue to me. A means a perfectly smooth finish on the single layer. B means some streaking or splotching on first layer but perfectly smooth on second layer. With an off-white or grey base, these colors will be smooth on the first layer. C means very streaky/splotchy on the first layer and somewhat streaky/splotchy on the second layer. Off-white or grey basecoats will help these colors, but a second layer will be necessary for smooth coverage. A third layer will probably be needed over a white basecoat for smooth coverage. D means very streaky/splotchy on the first layer and second layers and somewhat streaky/splotchy on the third or fourth layers. Off-white or grey basecoats will help these colors some, but multiple layers will still be necessary. Avoid these paints if at all possible. None of the paints in this test rated this badly. Some paints may have a parenthetical letter that indicates if the color has a noticeable green (n) hue or purple (p) hue. Most of the blues don’t look particularly green. Blues that look more purplish are in a separate “intense” section. If a paint is not otherwise described, it’s a “normal” blue. Some ratings may have a plus (+) or minus (-). This means that the rating is noticeably higher or lower than most paints with that rating, but not enough to justify a higher or lower rating. Abbreviations: VMC means Vallejo Model Color. Due to issues with Vallejo changing paint names, I included the stock number. VGC means Vallejo Game Color. VGCX means Vallejo Game Color Extra Opaque. VMA means Vallejo Model Air. VSP means Vallejo Surface Primer. I’ll use the full name in the paint list, but the abbreviations after that. Unsurprisingly, blues have great opacity and coverage. Craft paints were not thinned unless otherwise noted. Reaper HD Dragon Blue is the best blue, in my opinion because it is a vivid blue with excellent opacity and coverage and not particularly light or dark. Reaper HD Ice Blue is a bit lighter than Reaper HD Dragon but otherwise similar in color. Its opacity is worse than Reaper HD Dragon Blue, otherwise I would have picked it. Craft Smart Matte Bright Blue is a cheap craft paint from Michaels with surprisingly good performance. Slightly darker than Reaper HD Dragon Blue and a bit brighter than Citadel Caledon Sky. A good looking blue. For 70 cents a 2 oz bottle, a steal. Craft Smart Matte Mediterranean Blue is very close to Reaper HD Dragon Blue. When thinned it’s rating is B/A/1/A. Citadel Teclis Blue is a solid blue that’s close to Reaper HD Dragon Blue. A solid blue and competitive with Reaper HD Dragon Blue. Citadel Temple Guard Blue was a light greenish blue and almost a perfect match color-wise with the Reaper HD Tropical Aqua. Craft Smart Matte Pool Blue is lighter than Citadel Temple Ward Blue. When thinned, it’s rating dropped to B/A/1/A. Craft Smart Matte Island Blue is lighter than Reaper HD Tropical Aqua. When thinned, it didn’t change. Citadel Lothern Blue is a greenish blue but more blueish. Citadel Hoeth Blue is a somewhat drab lighter blue. Citadel Calgar Blue is a solid blue similar to but darker and a bit more vivid than Citadel Hoeth Blue. Craft Smart Matte Pale Blue is a little darker than Reaper HD Blue Flame. When thinned, drops to D/A/1/B. I think I’d take it over Reaper HD Blue Flame. Reaper HD Blue Flame was the lightest blue tested by a sizeable margin, but fairly drab. Its opacity was inferior to most of the other light blues. Coat D’ Arms Marine Blue was the best in my opinion. A pleasing medium blue with excellent opacity and coverage. Testors Model Master Acryl Cobalt Blue is a perfect match for Coat D’Arms Marine Blue. I use the Model Master Acryl Paints exclusively for airbrushing (and they are excellent). However, this color turned out to brush quite well. It is much thinner than the Coat D’ Arms however. If you prefer thinner paints, this paint is a good alternative for Coat D’Arms Marine Blue. Citadel Caledon Sky Blue is a good contender for best. It’s not quite as vivid as Coat D’ Arms Marine Blue, but it’s still a nice blue with excellent opacity and coverage. A good alternative to Coat D’ Arms Marine Blue. Coat D’ Arms Wizard Blue is similar to Citadel Caledon Sky Blue. A good medium blue. Citadel Thousand Suns Blue is a rather drab green/gray blue. 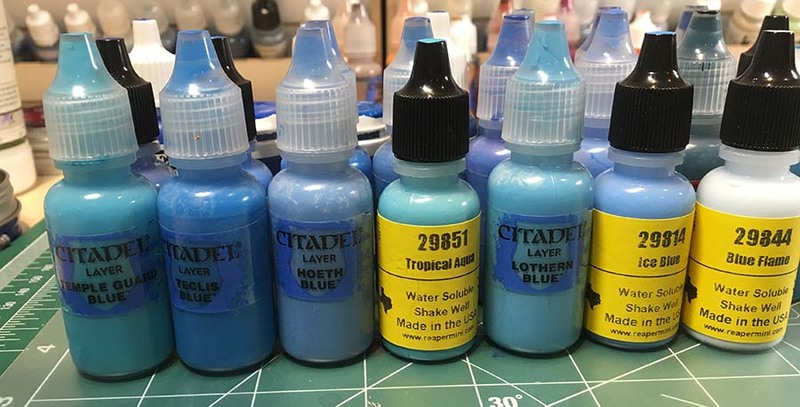 Citadel Thunderhawk Blue is a drab green/gray blue but is darker than and has much better opacity than Citadel Thousand Suns Blue. Citadel Alaitoc Blue is a very drab blue, very close to Citadel Caledon Sky Blue. Craft Smart Matte Dark Blue is close to Citadel Altdorf Guard Blue and better when not thinned. When thinned, the first layer’s coverage worsens, but it will still produce good coverage with two layers. Citadel Altdorf Guard Blue is very close to Coat D’ Arms Marine Blue, but with much poorer opacity and coverage. These blues are the more purplish blues. Vallejo Model Color 925 Intense Blue is the best of the bunch in my opinion. Not quite as purplish as Reaper HD Rich Indigo or Citadel Macragge Blue. Vallejo Model Color 899 Dark Prussian Blue looks like Reaper HD Rich Indigo only much darker. Reaper HD Rich Indigo is almost identical to Citadel Macragge Blue. I’d choose Rich Indigo simply because you get a dropper bottle and a little more paint (14 ml vs 12 ml). Craft Smart Matte Peacock Blue is less vivid than VMC 925 Intense Blue. When thinned it’s rating is B/A-/1/B. Citadel Macragge Blue is almost identical to Reaper HD Rich Indigo. Citadel Kantor Blue is a very dark intense blue. It’s also in the Dark Blue section below. Deco Art Ultramarine Blue is a vivid blue craft paint very close to VMC 925 Intense Blue. Poor opacity and poor coverage. And it’s one of the “premium” craft brands. Vallejo Game Color Extra Opaque Heavy Blue is the best of the dark blues in my opinion. Dark, but definitely blue, with excellent opacity and coverage. Citadel Kantor Blue is a very dark, intense blue. It’s also in the Dark Blue section below. Reaper HD Winter Blue is a drab, greyish blue. Reaper HD Nightsky Blue is a drab, dark blue. Reaper HD Solid Blue is a drab, dark blue a tad lighter than Reaper HD Nightsky Blue. Citadel Incubi Darkness is a drab, very dark blue that looks like black at first glance. No one paint range is superior across the board. All of the paints had good opacity and coverage and most had excellent opacity and coverage. So none of them were unsuitable. See my comments at the end of the Red Acrylics Comparison for comments on craft paints.